Lining up a Fresh RV Truck, to start our full timing with was in our thoughts... but maybe two years out. I kinda jumped the gun! The Feds mandated fuel change and the new emissions standards for diesels that take affect this year and next pretty much forced my hand. The RV Truck manufacturers have had to redesign their diesel engines and vehicles to meet the new standards. I've never had much luck with vehicles in the first year of new engines/technology so I decided to trade in the Old '98 and pick up a new pickup now! 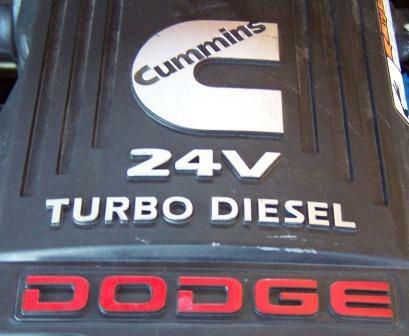 My understanding is that the 2007 Cummins will be a larger displacement engine with lower horsepower and a catalytic converter. That says lower fuel mileage and more hassles to me. I may turn out to be wrong, we'll see. 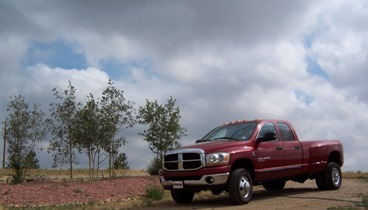 Until then I'll just have to suffer along with this poor old brand spankin' new Inferno Red, 2006 Dodge 3500 Dually! Several high mileage drivers as well as diesel mechanics have told me, that they have experienced much less injector fuel pump difficulty once they started using one of the quality "lubricating" diesel fuel additives. I am told this is going to be much, much more critical with the new low sulfur diesel fuel. It only adds a dollar or two to the cost of a fuel fill up, but balance that against $2,500 fuel pump failures)Howes and Lucus are the two brands that have been highly recommended to me (and which I am using) with Howes being the most easily available. Big Horn edition, Quad cab, 6spd, 4wd, Sirius radio and 6 CD stereo, trip computer, 3.73 diffs, with 325 HP and 610 ft. lbs. of asphalt grinding torque! We bought this RV Truck through the Costco vehicle purchase program. This is the first time we had ever used the program and were very pleased. The price was fair and I thought a very good discount. The hassles of negotiating to get the deal were non existant, as that had already been done by Costco. There was a glitch or two when it came to the actual financing but they were minor, had nothing to do with Costco and were quickly handled. If you are a Costco member or are considering joining I would strongly recommend you look into that, as well as their auto program.It worked for us! I thought my '98 was a runner, and it is. 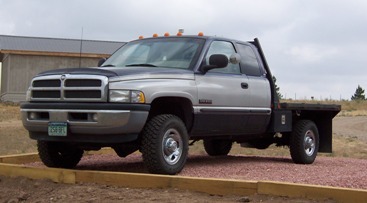 But I have to tell you this new 2006 Dodge 3500 dually will pull that good old '98 in half! It's now become my favorite of all the Trailer Tow vehicles I've owned. And I haven't even pulled the fiver with it yet! Life is sweet all over again! Pretty pathetic isn't it? A grown man gettin' all giggly about a truck! Well I am! I love this truck! One thing I was a little worried about was fuel mileage. I don't suppose I am alone there. This rig is a lot heavier than the '98, though I haven't weighed it yet. Right after I got it, I had to make a family emergency run to Tucson. Only had 350 miles on the odometer. Took off, varying my speed for the first 1000 miles or so to break it in proper. On that leg I only got 14.9 mpg. I did have to fight a straight on headwind all the way down I-25 from Fort Collins to Hatch N.M. though. Running around in Tucson for a week or so it had loosened up considerably and I was getting 17+. Coming home I broke through 21 mpg across northern Arizona, running 65 mph on the two lane for a couple hundred miles. Got 18.9 mpg climbing Coal Bank pass to Silverton and climbed back to 21.9 coming down the north side into Ridgeway. So at this point with just over 3000 miles on the "Big Red" RV Truck I have to say the fuel mileage is no longer a worry. I expect it to continue to improve until I break through 10,000 miles. I still need to check it out with the fiver on ( still getting hitch, brakes, fuel tank installed) but I expect this Dodge dually truck to deliver no unpleasant surprises and provide great performance as our long term RV Truck! You'll be able to read about that performance right here! We just finished a 2500 mile 11 day trek to Wisconsin and back via I-80 among others. The first "big trip" pulling the fiver with our new RV Truck. Our average suffered on I-80 even though I travel prettty easy at 65-68 mph. The wind was just awful. Going east we had a quartering wind out of the SE and coming home we had it hitting us out of the NW and nearly head on. Talk about bad karma! The west side of Nebraska coming home the wind was just howling!It was pushing the tail of the fiver sometimes 6" with gusts. Kind of ugly. But the wind didn't push that big Dodge 3500 Dually anywhere! It sure ate fuel though. Averaged just over 9 mpg both ways for the most part. The first section heading back south I took some two lane going from West Bend to Dubuque. Rolling along at about 55mph the consumption dropped to 14+mpg. Not bad for a fairly big rig! As soon as we cut straight south at Cheyenne, no longer fighting the wind and rolling at 65+ it jumped to 14.5 and better as well. All in all I would say it will average between 12.5 and 14 mpg under good conditions, with the fiver on, and drop to 9 mpg when things get a mite ugly. Running bobtail, and working to get mileage, I often break 20mpg and can squeeze out 22 on occasion with this Dodge 3500 RV Truck. Handles like a dream, takes the lumps in stride and makes me a proud RVer, rolling down the road! No regrets with this truck! This thing turns quicker and rides better than my '98 2500 even though it has arround 2000lb more load rating. And it's so quiet you can't believe it's a diesel!